The RTC supports and funds a variety of transit projects, including funding for expansion and improvements to local bus service, accessible transportation services, and planning studies. Several local and regional agencies are working together to study bus-on-shoulder operations along the congested mid-county portion of Highway 1. 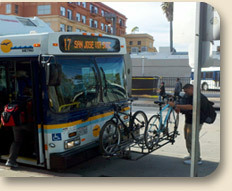 The Santa Cruz County Regional Transportation Commission and the Santa Cruz Metropolitan Transit District (METRO) received a Rural or Small Urban Transit Planning Studies grant from the California Department of Transportation to conduct an on-board transit ridership study. The on-board transit ridership study was performed by Moore & Associates and consisted of an on-board survey, an assessment of on-time performance and boarding/alighting counts for the fixed route service in Santa Cruz County. The primary purpose of the project was to collect data needed to support the transit component of the regional travel demand model managed by the Association of Monterey Bay Area Governments and to support future transit planning efforts. The results of the study can be found in the August 2012 Final Report. Sign up to receive periodic enews information on regional transportation planning projects here.